After an early morning start and short drive over the border we arrived at Burnaby Mountain High School, BC ready to play netball against our Canadian neighbors. As always we were welcomed with warm and friendly smiles and some great netball to boot. The first game was against the local Comets team and we fielded a combination of Chinooks and Dragonflies players. 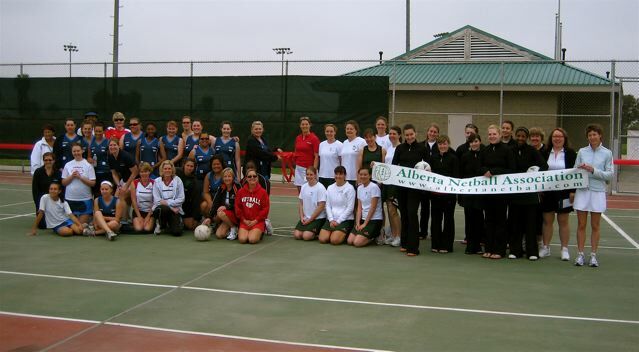 The players were: Sue Battersby, Lesley Everett, Tubi Gulley, Jules Lapworth, Georgina Thomsen, Kim McKeown and Kim Paull. These girls had a great game starting out strongly to come away on top at the end of the first quarter. They continued to dominate the game with some great defensive play not only in the opposition shooting circle but also through the court. The second game was against Checkers, or CHE, and proved to be a tough fight. I have since learnt that most of this team is made up of ex-national Canadian players! This game was played mostly by Rain Birds with welcomed help from Chinooks and Dragonflies. The players were: Tina Hanna, Lesley Blyth, Jane Flores, Jules Lapworth, Georgina Thomsen, Tubi Gulley, Sue Battersby, Lisa Washington and Shirlene Lim. This was definitely a game of two halves. We unfortunately had a slow start to this game which gave CHE a handy lead going into the third quarter. However, the team fought hard and never gave up coming back to win the third and fourth quarters. Unfortunately this was not enough to win the game. Thank you to those players that were able to make this trip, as always you did the club and yourselves proud. Some of the Canadian players are very keen to come down to Seattle to play so hopefully we will be able to host our first 'International Games' in the near future!